Launching a game is hard. So what happens when you release a high-profile title with the world watching and things break? Lots of things. Worse, it takes at least a day to fix stuff when a retweet can happen in seconds. Let’s talk to H1Z1’s senior game designer Jimmy Whisenhunt. A fix was eventually found but nothing that could be implemented that day (“We couldn’t figure out why at the time, but eventually we found some hardware stuff that we ended up solving,” explains Jimmy), so for the time being the only solution was to “just let people trickle in slowly and start watching the streams”. The decision was made to start over: to shut everything down and start again. Slowly. So how did H1Z1 not know what would happen at launch? Eventually, of course, people managed to get in, but Early Access is, by definition, unfinished and the fun of making it all work kept coming. Soon, another issue raised its head. Or rather didn’t: “Zombies didn’t move,” says Jimmy. “That was really scary, because one of our big dreams for this game is that you want people to feel like a survivor in the zombie apocalypse. That you are afraid for your life because of the world, not just because of players. And then, ‘oh God, they don’t move. What happened? They worked fine yesterday!’” It was a server issue again, which Jimmy describes as “good news” because it was something the team were already on top of before people started reporting it. One issue that soon became apparent was that of loot. My own early experiences consisted of hours running around with a makeshift bow, pockets oozing with blackberries and little else. One evening saw my entire gear haul consist of a shirt, a knife, a tin of food and as many sticks and berries as I could carry. It’s not an issue now (there’s stuff now. Inside things!) but it took a while to get there. It’s an issue that seems to still be seeking a full solution. My most recent games have seen me finding just enough to to be worth fighting for, but not enough to feel safe. You might find a gun in the first half hour or so, but barely any bullets. Rattling around a small deserted town with four bullets and terrified of other players (‘Friendly’ is the universal cry of someone about to kill you), makes the game feel almost like a The Last Of Us MMO. And while some have tried to embrace a more pacifist approach almost every human contact I’ve had has ended in death or a retreating Mexican stand off. 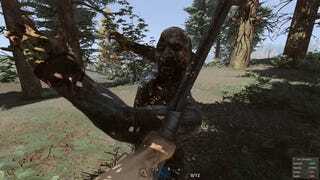 Talk of guns, however, brings us on to what was one of H1Z1’s defining features at launch, the so-called pay-crates. The in-game economy lets you ‘buy’ air-drops, where boxes of supplies are dropped into the map somewhere. The idea was that while you could purchase these things, you had no say where they would land and it would create a “world event” as everyone who saw it could fight for the content. It didn’t work that way. Within hours of the game going live people were buying crates that landed right next to them, and that contained a weapons, giving them an immediate paid-for advantage. Across Reddit and forums the cry of ‘pay to win’ went up. Trying to defuse the situation didn’t help, either: “I tried to talk on Reddit a couple of times and I was downvoted to oblivion and people were insulting. I started to realise that a lot of these people didn’t own the game. Someone saw something, they assumed something was happening that wasn’t without trying it themselves and it blew out of proportion. It’s horrifying because the last thing anyone wants to run into in their professional career is to be called a liar. “I think the worst for me was not being able to react faster” says Jimmy of those fraught few weeks post-launch. Fortunately, most of the big teething-issues seem to be behind the team. Much of the forum and Reddit discussion currently focuses on minor bugs, balancing and ideas for the future (one issue I’ve encountered recently has been a weapon/animation lock up leaving me defenceless). Patches and balance measures continue to fine-tune the experience and players seem to have largely forgotten the shaky start (although they’re still murderously callous bastards). I still think it’s a little too early to really judge the game but recent improvements have made a world of difference. When I first started playing I wandered forests for hours with nothing but a bow and pockets full of blackberries. Now there’s far more potential to feel like a survivor as you dodge the undead and the living alike, trying to scrape together enough to endure. It might have taken Daybreak a few hammer whacks to get it all working, but the fun is starting to emerge.